BROOKLYN, NY-Excellence Charter School in the Bedford-Stuyvesant neighborhood of Brooklyn, NY, recently completed an overhaul of the school's auditorium. 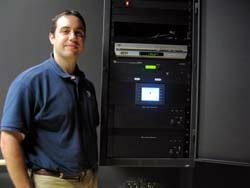 Jim Maltese, president of Audio Visual Resources, stands by the new equipment rack at the Excellence Charter School of Bedford-Stuyvesant. After construction was completed (extending the auditorium approximately 20 feet further than the original structure) Williston Park, NY-based Audio Visual Resources, the design/build firm responsible for the project, commenced work, with installation completed in August 2006, just prior to the new academic year. Budgeted at approximately $25,000, key design criteria included the necessity for simplified, trouble-free operation that would enable teachers to operate the system without AV attendants, along with the ability to shield it from anything that could possibly render the system inoperable, such as unauthorized student access. According to Jim Maltese, the system's designer and president of Audio Visual Resources, "This facility will host presentations, movie nights, school assemblies, plays, concerts, etc. The challenge was in creating an environment with the flexibility to accommodate multi-function use, yet have it remain easy to operate, so that a teacher can manage the system with no more than a brief orientation." To address these concerns, Maltese created a system centered around Crestron's MC2E compact control system and a Lectrosonics DM1612 digital automatic matrix mixer. To support video playback, as well as computer-assisted learning and presentations, a 180-inch (diagonal) Da-Lite Tensioned Cosmopolitan Electrol ceiling-mounted electric screen, coupled with an NEC MT1075 4000-lumen, 1080p-capable LCD projector were installed. Computer access into the system is facilitated by an Extron RGB laptop interface. The audio system includes five Shure PG48-XLR microphones, coupled with a JVC HR-XVC29S combination DVD/VHS VCR playback unit. The system is wired for eight microphone inputs-with input panels accommodating four microphones each on stage left and right-coupled with two inputs each from the NEC combo player and the laptop interface. This arrangement provides permanent connections for the DVD/VCR and laptop interface inputs while providing students and teachers freedom to position the five microphones as required throughout the stage area. Driving the system is a TOA P-924Mk2 240-watt power amplifier that feeds a distributed audio system consisting of 28 TOA F-2852C wide-dispersion ceiling speakers. All equipment, including the Crestron controller and the associated TPS-2000L 5-inch wall-mount touchpanel interface, are housed in a 24RU wall-mounted equipment rack with a locking front panel at stage right, behind the curtains and out of view. Operation of the entire system is handled via the Crestron touchpanel. "Since the teachers must control the AV system while maintaining supervision over their students," said Maltese, "the system is positioned in such a way that they can operate the setup while managing their students." In an effort to ensure easy, trouble-free operation, the Crestron system was configured for level control only. "The biggest challenge was to provide a flexible enough system that is easy to use," noted Maltese, "and this is exactly where the Lectrosonics DM1612 comes in. With its Proportional Gain and Autoskew automatic mixing capabilities, this is a real plug-and-play solution. The DM1612 does a remarkably good job of matching levels, eliminating the need for a student to operate a console and, in turn, minimizing operator error." "Combined with the LecNet2 configuration software for Windows," continued Maltese, "we were able to define the mixer's operating parameters and lock them into memory, while also having a backup copy for reference. We carefully configured the system to the room's acoustics, using preferred speech curves on the microphone input channels and specially defined program curves for the laptop interface and DVD/VCR combo channels. From there, we locked it all down. For this sort of application, the DM series mixers are ideal." Maltese commented on what may initially appear as a rather small setup, "The combined functionality of the Crestron and Lectrosonics equipment creates a surprisingly robust, capable sound reinforcement package with far more features than one would normally expect to find in an elementary school environment. We could easily incorporate a wide variety of additional gear. The Crestron system is able to handle more equipment and the Lectrosonics mixers have digital I/O ports for easy daisy-chaining of additional units. The setup is quite future-proof."